Cheesy Ham and Scalloped Potatoes: Leftover ham shines in a simple ham and potato casserole made with sliced potatoes and a homemade sharp cheddar cheese sauce. This recipe for scalloped potatoes and ham is great as a side dish or a main course when served with a side of veggies . Every once in awhile I strike gold when I least expect it. Cheesy Scalloped Ham and Potatoes was one of those times. 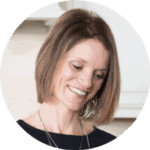 I am always in my kitchen dreaming up new recipes and many times we have something new and delicious like Sweet Potato Nachos or Southwestern Quesadilla Salad, and other times we have disasters–I just don’t share those! But there are still the days when I am stumped as to what to make my family for dinner. I typically have a weekly game plan, but there are times, many times, plans change. I forgot to take out chicken from the freezer or after-school activities run longer than planned–you know how it goes. Last week it rained on my grocery day. Just like my sweet puppy, I hate to go out in the rain. And I am spoiled. I live in an area where the sun shines more than it doesn’t. So if it happens be raining and I have enough food to change-up my shopping day, you better believe that I refuse to put my rain boots on. On this particularly gloomy day, I checked around in my pantry and found some potatoes leftover from a huge 10 pound Costco special and some leftover Balsamic Fig Glazed Ham pushed to the back of the fridge. Hmmm, how did that get overlooked? I was wanting to make ham sandwiches earlier that week and thought the ham was gone. I can be blind at times. My dad always made scalloped potatoes when my mom prepared ham. However, I did not have enough ham to serve on the side of the potatoes–so let’s put it into the homemade scalloped potatoes, I thought to myself. And I decided instead of my Dad’s traditional butter sauce, I wanted a cheese sauce. My kids would want a cheese sauce. YOU want a cheese sauce! Don’t you?! Oh yes, the ham gets slathered in cheese and a bit crispy on top. Now I was onto something. So my humble leftovers became Cheesy Ham and Potato Bake. My strike of gold. My ticket to praise from my family. You need these Cheesy Scalloped Potatoes with Ham in your life. You need to strike some gold yourself. You need to hear that praise. It is so much better than just a serving of ham with scalloped potatoes. If you like your potatoes really fall apart tender, you can parboil the potatoes whole for 7-9 minutes and then slice any layer in your casserole. This step is not necessary but does make the potatoes very creamy and falling apart tender. I used my 2 1/2 quart oval dish but any 2-3 quart casserole dish will work as long as it is deep enough to pour the cheese sauce over. I love to use sharp cheddar cheese in this Cheesy Ham Bake for really pronounced cheese flavor, but if you have swiss, colby, or even mozzarella–use that. After pouring the cheese sauce over the potatoes, use your hands to push the potatoes and ham into the cheese sauce before baking. This ensures that the nothing dries out. The paprika sprinkling on top is COMPLETELY optional. It just adds color. Leftover ham shines in a simple ham and potato casserole made with sliced potatoes and a homemade sharp cheddar cheese sauce. Preheat oven to 375 degrees. Grease a 2 1/2 quart baking dish. Layer half the potatoes in the baking dish and top with 1 cup diced ham. Repeat layers. Heat the butter over medium heat until melted, whisk in the flour and cook for 1 minutes. Slowly whisk in milk, salt, garlic powder, and onion powder and cook until milk is just about boiling. Whisk in the cheese until melted. Remove from heat. Pour the cheese sauce over the ham and potatoes. Sprinkle with paprika. Cover with foil and bake for 60 minutes. Remove foil and bake for an additional 25 minutes or until potatoes are tender. If you are using a very salty or smoked ham, decrease the amount of salt to 1/2 teaspoon. Such a classic holiday dish! Loving your addition of ham! Thanks Rachel. It turns a side dish into a main course that is loved by everyone! This looks wonderful! 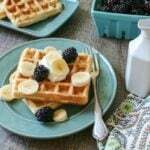 Your ability to come up with meals “on the fly” using ingredients you already have is amazing! I will definitely be trying this one out! Thanks Angela! You must check out the full post on Grocery Shop for Free as well–you will find plenty more uses for that leftover ham! Yum! These Ham and Potatoes look delicious! Oh my this looks yummy! I might have to make this for Easter. My family would love it. I hope you do make this for Easter Denise! Wow wow wow. I love everything about this casserole. Especially that it originated from leftovers. Leftovers are awesome! The cheesy sauce, the ham….so delicious! Have a great weekend Kristen! Thanks so much Allie. I am right there with you, leftovers can be amazing! Have a great weekend yourself friend! 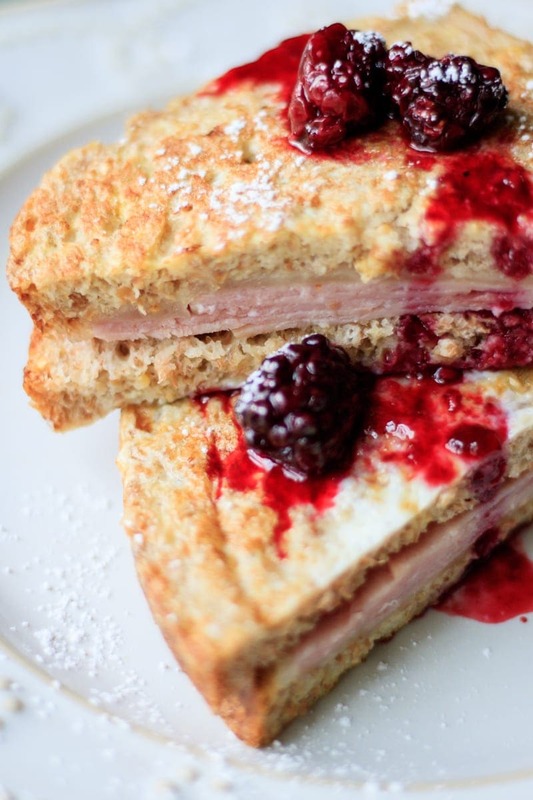 What a great way to use up leftover Easter ham! A nice way to use up some ham – scalloped potatoes are always good! Scalloped potatoes are amazing anyway but PLUS HAM?! You’re a superhero of potatoes. You are too kind 🙂 but yes, Ham takes this from side dish to main dish and wow!! I hope that your family loves this dish as much as we do. I used your recipe last night and the whole family loved it, including my picky 8 year old son, who doesn’t like potatoes OR cheese! Definitely saving this one to use again! can I make it ” ahead”? does it freeze well? how far in advance? Freezing potatoes can be tricky. I would prepare this dish as stated, but slightly underbake the casserole. So bake at 350 for 40 minutes. Remove from oven and allow to cool completely. Then cover with foil well and freeze. When ready to eat the dish, allow it defrost in fridge for 12 hours and then bake at 350 degrees for 30 minutes covered, and 15 minutes uncovered. This will taste best if eaten in 1 month time frame, but will still taste fine up to 4 months. Saw your recipe and started to crave scalloped potatoes and ham. Was very yummy. Guess my only issue is next time I make them (because this will definitely be made again, again, again) is for me to parboil the potatoes first. YAY!! I am so glad you liked it! And if you like your potatoes very soft, parboiling is a great idea! Make sure you use a rectangle dish. I used a 2 quart dish as called for but square and it was a disaster. Also I would suggest layering the cheese sauce and not just pouring over the top. Again that was a disaster. Lastly certainly did not need three pounds of potatoes. Used two and ended up wasting a ton. Not my favorite Pinterest find. Lots of wasted ingredients because of poor directions. Sorry Laura that you had such poor luck with this recipe. I have updated recipe to state 4 quart, as 2 quart was a typo. And therefore, you should use the full amount of potatoes and pouring the cheese sauce over top works great. I absolutely hate that you had issues with wasted food, because that is certainly one thing I try to prevent. SO sorry! Yummy! I think even my picky eaters will love this. Thanks for the recipe! You bet! I hope your family enjoys! I made this today, it didn’t turn out quite as I had hoped. I was expecting scalloped potatoes with ham, i.e. 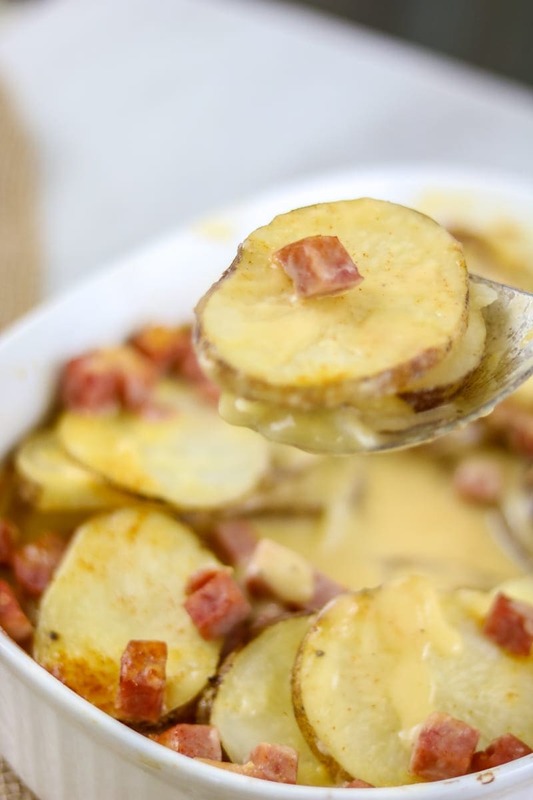 potatoes and ham in a creamy, cheesy sauce, but after baking, the milk, cheese and flour had curdled into blobs leaving a clear watery liquid. The ham I used gave it a smokey tang, but also contributed salt, so the dish was on the verge of being too salty. I’d advise going easy on any added salt. All in all, the dish was tasty and enjoyable but a bit disappointing in texture and appearance. Hi Larry! I am sorry it was not as you expected. Let me help you trouble shoot: Did you allow the cream sauce to fully incorporate and cook for a few mintues to get thick before pouring on your potatoes and ham? Did you whisk the mixture well while cooking? Did you overcook the cream sauce by keeping on high heat? I have never had this mixture curdle, so I am trying to figure out why this could have happened for you. As far as the salty ham, that is a GREAT point, and I am going to add that to my notes. I used a very low sodium ham, so yes the salt amount should be adjusted for based on ham used. I am glad you still enjoyed the taste. As for the curdled texture–be sure to whisk flour fully into milk and heat over lower heat–what will help in the future. I made this for dinner last night. I followed the recipe without making any adjustments and it was DELICIOUS. All three of us loved it and since we still have some ham and potatoes, I might make it again tonight! OH YAY!!! This makes me so happy Sarah! I am so glad it was such a hit with your family! Do you mean to say that you were the first person to think of putting ham into a potato casserole? Then you must have a time machine! LOL. Because my mom used to make this all the time when I was a kid many years ago. She would add thinly sliced onions onto the layers of potatoes, and I dare say there was even Velveeta added on occasion for creaminess. Always a family favorite! Davey, I certainly was NOT the first person to think of this recipe. 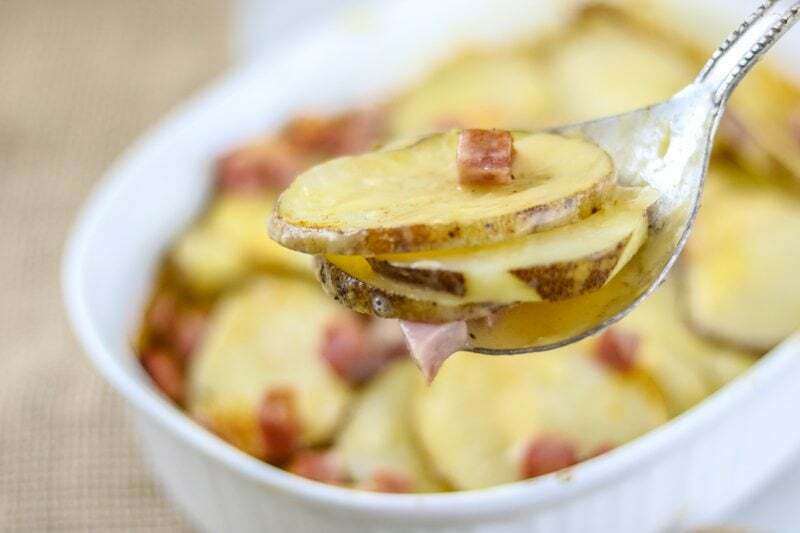 Just the first person in my family 😉 My dad always just did potatoes and onions and we loved it–the ham just made this side dish worthy of being an entree! I made this last night, with the addition of thinly sliced onions (once you have the mandolin out, it’s hard not to keep using it!) and it was awesome! Thanks for the inspiration. You bet! And Davey, I think next time I make this, I will add onions myself! I love how easy (and cheesy!!) this potato dish! I can’t wait to work it into rotation. YAY!!! I just know your family will ADORE IT! Love that you kept the potato skin on the potatoes. I am totally making this. YAY!!! Enjoy every bite Helene! This is one of our all time FAVORITES! Saw this recipe online and decided to try it for dinner this evening. What a hit this casserole turned out to be for my husband and son. Made it with a small thinly sliced onion on the mandolin like Davey mentioned in your comments and what an absolutely delicious dish this was! Thank you for the great recipe. It will become one of our family’s favourites. YAY!!! 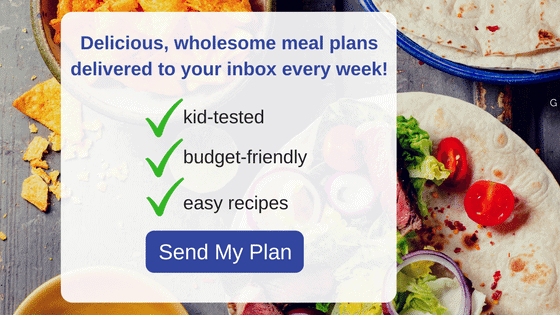 I love hearing when people love my recipes–especially when the family enjoys! And I am with you and Davey, I love the addition of onions–but my kids not so much 😉 I hope you enjoy this recipe for years to come. Just made this casserole tonight, with a few substitutions…. add the finely sliced onions on each layer, and also poured half of the cheese sauce on each layer. For the sauce I didn’t have milk so I used 1 cup good chicken stock and 1 cup heavy whipping cream, cut the salt back to 1/2 tsp (Maldon smoked sea salt) and shredded a cup of pepper jack cheese. It was amazing! I know it wasn’t exactly your recipe, but that just proves that yours is so wonderful that it can be adapted to endless variations! Thank you so much for posting it! I think next time I may add some shredded cabbage…. and dill! Hi Sandi. Thank you for sharing your adaptations. I truly try to create recipes anyone can adapt based on what you have and enjoy. And I think cabbage is genius. The whole family loved this! I did add sliced jalapenos in the middle on half. I personally liked the half with the hot peppers, but some of my family doesn’t like hot peppers. The heat did migrate to the other half a little bit. Oh Arlene, I LOVE the idea of jalapenos I may try that for my family (half and half) like you did for the same reasons. Do you think I could make this in the crock pot? Hi Megan! 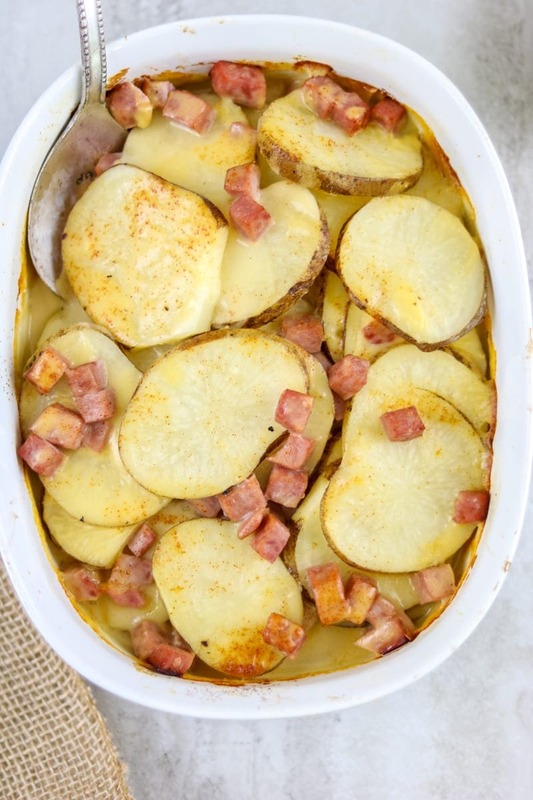 This casserole can be made in the slow cooker, layer the potatoes and ham and then make the sauce on the stove top. Pour over the potatoes and ham, being sure to push down the layers so the sauce covers the potatoes. Cook on low for 6-7 hours or until potatoes are tender. 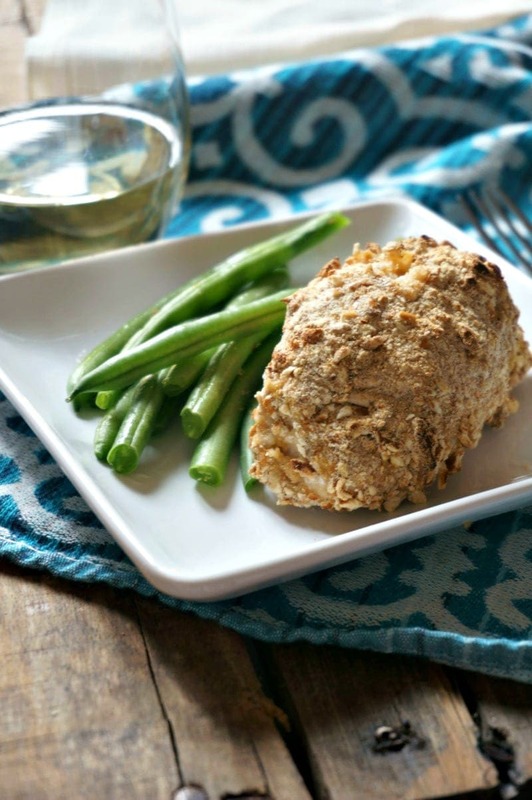 This is a recipe you will really want to grease your slow cooker or use a crock pot liner, as this can be a bit messy to clean up in the crock pot. Enjoy! This recipe made our post-Thanksgiving meal almost as fabulous as Thanksgiving itself. Thank you for posting it! That is awesome Carol! Thank you so much for sharing. YAY!!! Thank you so much Brittany for sharing your results and modifications. It makes my heart so happy every time people sit down and enjoy one of my recipes. Enjoy those leftovers. Made this for dinner tonight and my boyfriend and I absolutely loved it! Hi Dan! I am so glad you and your wife enjoyed! I love the addition of onion and garlic (my kids prefer it without though!) I hope you will be enjoying this for years to come. I have tried SO many different scalloped potatoes and ham recipes and none seemed to come out right. So, I wasn’t expecting to have success with this one. Your recipe was AMAZING. The family loved it! Def keeping this one in my recipe box. Thank you!!!! Thank you so much Melissa for taking the time to let me know how much you enjoyed these Scalloped Potatoes. I am so happy they were a hit! This is a recipe I will make again and again. Reminded me of a youthful favorite. The only change I made was to add a bit of pepper. A true comfort food. Oh I absolutely LOVE hearing this Karen! Thank you for sharing.